I don’t particularly love the sandbox-survival genre – made famous by Minecraft – or care to dabble in every one of its corners. I often play these kinds of games in a 3-4 hour chunk, vigorously exploring, crafting, and building until the well of joy runs dry and I rarely come back to them. Turns out, though, Terraria ($4.99) has one hell of a deep well, and has had me coming back for more on more occasions than I can count. Racing to get into the game, I skipped the tutorial because I’ve done this before. I’ve crafted ALL the craft. Everything is as I expected; your custom character drops into a randomly-generated world, and you’re off. Chop down trees for wood and then turn wood into walls. Turn walls into castle, and then turn castle into the USS Enterprise. All of it is here, except now in beautifully pixelated 2D sprites. 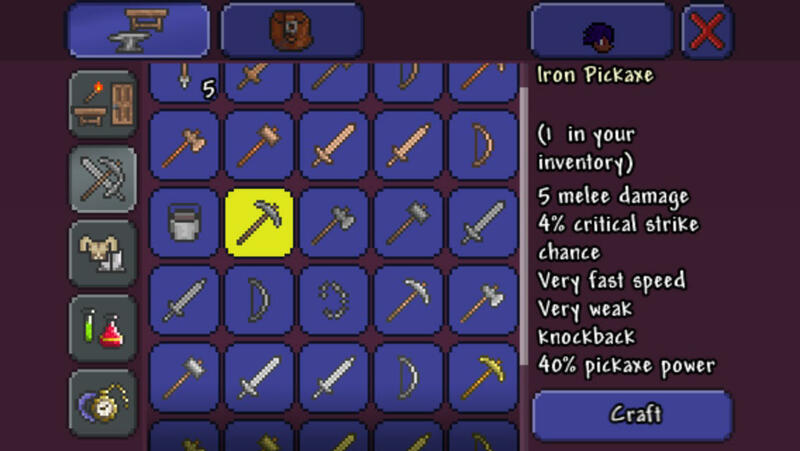 Terraria did not stop at simply crafting and building, though, it has a combat systems too. When you’ve got your sword swinging, it plays much like a clunky-er Ghouls n’ Ghosts as you defend yourself from one-eye freaks, and Jell-O-blobs, that lurk about the night you reap their spoils. Those spoils allow you to craft better stuff. Things like armor, weapons, furnishings, tools, etc. Combat remains to be Terraria’s stand-out trait from the competition, giving the player more vibes of action-adventure RPGs than any other genre-heavyweight I’ve played. It’s no lie this game is systems-heavy, so if you enjoy bouncing between complex systems Terraria has you covered. The joy of this genre is exploring, uncovering secrets, and discovering systems you never expected to exist and as such it’s a disservice to the product to overly explain everything it has to offer. But, what is safe to say, is that the game will constantly surprise you as you delve deeper into what is possible both with building and exploring. Of particular note is your buildings actually serve a purpose to house NPC’s, rather than just being yet another abandoned wizard tower in your Minecraft world, and much, much more. Yet, with all this praise, Terraria still has a lump to complain about. Surprisingly enough, it’s not in the control department either. The virtual controls worked perfectly fine for me, after a bit of practice, with little to no hiccups. Instead, the lack of multiplayer at launch is the biggest bummer. I also experience some odd frame-rate issues during my time as a lumberjack, on my iPad 2 but this doesn’t seem to be an issue at all on newer hardware. 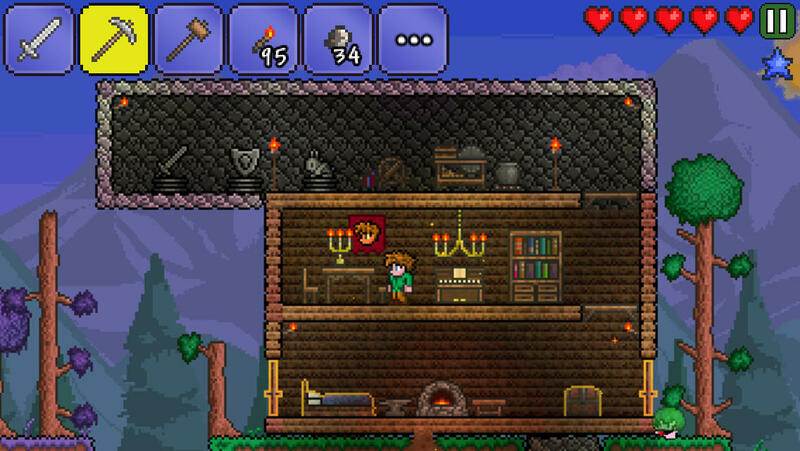 On the topic of iPad: if you’re not playing Terraria on one: expect to potentially be dealing with a few frustrations stemming from lack of screen-real-estate. I’m hopeful an eventual update will bring over the multiplayer we desire, but that’s a make-or-break-point in a week in which Terraria launches alongside a new Junk Jack game. I’m not here to compare every game of this kind, nor do I care to play them all. What I know is: Terraria takes a different approach to a formula proven by Minecraft in perspective, combat, immersive-storytelling and – most importantly – moments of discovery. It’s a treat, especially on the App Store where it seems like developers are just racing to clone Minecraft rather than bring any kind of innovation to the table. While by no means a replacement for the full PC version of Terraria, this pint-sized iteration is an effortless recommendation. 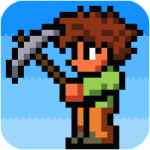 We’ve been waiting forever for Terraria to arrive, and while the additional screen real estate of the iPad makes it a bit more fun to play on the larger-screened device and multiplayer would be a welcome addition, this is just as much of a must-have for Minecraft fans as Junk Jack X.